Tuskegee University has announced that Loretta Lynch, the first female African-American U.S. attorney general, will deliver the keynote address during the university’s 134th spring commencement ceremony on Saturday, May 11. 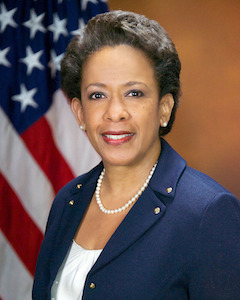 In April 2015, Lynch was appointed the 83rd U.S. attorney general by President Barack Obama and served in the role until January 2017, in addition to serving as head of the U.S. Attorney’s Office for the Eastern District of New York under both President Bill Clinton and Obama. Lynch has been described by Obama as “the only lawyer in America who battles mobsters, drug lords and terrorists, and still has the reputation for being a charming ‘people person.’” She was also a significant key player in creating the nation’s path on several tough issues, such as improving the relationship between local law enforcement and the communities they serve, in addition to criminal justice reform. She has spent several years of her 30-plus-year career moving through the ranks as a prosecutor, battling terrorism, financial fraud and cybercrime, while simultaneously defending and advocating for civil and human rights. During her time as the leader of the U.S. Attorney’s Office for the Eastern District of New York, she became widely known for the high-profile civil rights conviction of two Brooklyn police officers who brutally assaulted Abner Louima, a Haitian immigrant. The commencement ceremony will be held at the Gen. Daniel “Chappie” James Arena and will begin at 10 a.m. There will be limited seating for graduates and their families.